Edited by Francisco Veas . A dynamic physiological equilibrium known under the name of homeostasis is determined by endogenous factors and by interactions of organisms with their exogenous environment. To preserve this equilibrium state, which reflects a healthy state of the individual, the organism is constantly sensing and adjusting levels of factors involved in these mechanisms participating to the equilibrium. Most of these homeostatic factors are well preserved because of their highly relevant functional importance for life. Depending on species, some of them could vary in their expression, and will be adapted to the encountered situations. These conserved innate strategies will not only have effects on individuals, but also on populations and moreover in their relations with the environmental stimuli (temperature, humidity, chemical, infections, diet). A broad and conserved response to internal or external stimuli will very quickly be induced, in a matter of minutes, to generate a cascade of inflammatory processes in order to reestablish the homeostatic state in the organism as soon as possible. Stimuli inducing homeostatic changes can be of different nature: trauma, toxin, infection, genetic dysfunction, childbirth, etc. 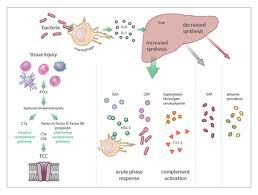 The process of acute inflammation is initiated by cells already present in all tissues, including macrophages, dendritic cells, Kupffer cells. These cells harbor surfaces pattern recognition receptors (PRRs), which recognize at the beginning of the infectious process, exogenous molecules broadly shared by pathogens (pathogenassociated molecular patterns, PAMPs), but not by the host. Important addition to PAMPs, but to a lesser extent, are non-pathogenic microorganisms which also harbor the highly conserved molecules recognized as non-self that will induce a very low level of local inflammation. This response is amplified by endogenously released mediators and by co-factors or concomitant stressful events (burn, trauma, apoptosis, etc.) as well as molecular mechanisms involved in the vicious circle of destructionreconstruction of vessels and tissues, acting through injury-associated signals known as Damage-Associated Molecular Patterns (DAMPs or Alarmins) and acute phase proteins. Moreover, some of the APP are also antimicrobials exhibiting a wide range of defensive functions, that alongside their repair functions help to reduce pathologic damage, and consequently help to restore the homeostasis. The maintaining of homeostasis requires rapid and short acute inflammatory responsiveness. Inflammatory mediators, including APP, exhibit short half-lives, which ensures that the inflammatory phenomenon ceases as soon as the stimulus disappears. In contrast, the presence of APP at increased levels can be considered as sensitive sensor of homeostasis disruption. Persisting levels of APP are observed in chronic diseases. The inflammation process is strongly associated with vascular changes as vasodilation and its resulting increased blood flow causes the redness (rubor) and increased heat (calor) as well as an augmented permeability resulting in a plasma protein leakage into the tissue causing edema, observed as swelling (tumor) and pain (dolor). Activated cells will then migrate the injury site. Depending on the intensity of inflammation and the organ in question, it is possible to observe the fifth component of inflammation as described by Aulus Cornelius Celsus in his treatise On Medicine (1st century BC) - loss of function (functio laesa) that results from cross talk between inflammation process and the central nervous system. The two volumes of Acute Phase Proteins book consist of chapters that give a large panel of fundamental and applied knowledge on one of the major elements of the inflammatory process during the acute phase response, i.e., the acute phase proteins expression and functions that regulate homeostasis. We have organized this book in two volumes - the first volume, mainly containing chapters on structure, biology and functions of APP, the second volume discussing different uses of APP as diagnostic tools in human and veterinary medicine. By using an open access publishing model, we wanted to facilitate a large access to readers from different places all over the world, notably developing countries, with the aim of contributing to a better world of knowledge. We also wanted to dedicate this book to our colleagues from both academia and industry in order to create values of knowledge in the field of control of inflammatory processes occurring in diverse diseases to improve the management efficacy of a more personalized medicine. At present, CRP and SAA are the most responsive APP during inflammatory processes in humans. In most cases they are associated with the erythrocyte sedimentation rate (ESR) marker, which strongly depends on high fibrinogen concentration allowing the sticking between erythrocytes. In mice, some changes are also reported for SAA. Despite the fact that the field of inflammation and its associated factors, including APP, cytokines antimicrobial peptides, etc., have been observed and studied from very ancient times, a detailed and updated knowledge is urgently needed as well as pivotal in future research for an integrative personalized medicine that takes into account several parameters including nutritional and systemic factors. Particularly, with the help of large-scale identification methods, such as proteomics, transcriptomics, metabolomics and interactomics, it should be important to get more precise data on kinetic and on the individual role of each APP within the network of the acute phase responsive elements. Thus, it should be important, in this research, to consider organs involved in this complex network - the central nervous system that reflects its involvement by fever, somnolence, anorexia, over-secretion of some hormones, liver being the main provider of APP, epithelial cells that produce cationic antimicrobials, bone being the site of erythropoiesis suppression and thrombosis induction, and the adrenal gland that produces cortisol to regulate inflammatory inducers, adipose tissue that induces changes in lipids metabolism. As a final note, I would like to thank InTech's editorial staff, particularly Mr. Vidic who managed, with patience, difficult tasks in helping the organization of chapter reviewing and finalization process.